Well, friends, the time has come. My computer…it’s lived a wonderful life. We’ve made it through every ounce of blogging I’ve ever done together..and now, I believe she’s done. If you know me well you are fully aware of my lack of technological savvy..I don’t need much with my computer..just the option to use that good old inter web and a place to store my photos (please pray they can all be recovered by some magical unicorn that has a degree in IT). But I think it’s time for an upgrade…because my computer won’t even show me its elderly little face anymore, just a dark screen. All I get are old, worn down, obnoxiously annoying repetitive beeps. So I’m going to assume this is it, but it was a darn good run. And however sad it may be, it’s nothing a little warm comfort food can’t fix! This is my favorite marinara sauce recipe with some savory roasted Italian sausage thrown in..SO yum. 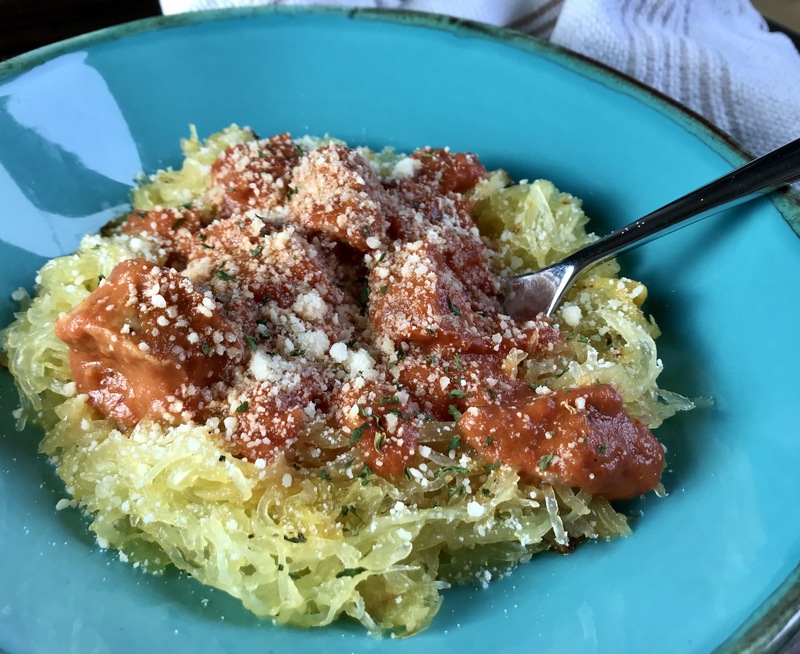 You can certainly serve the red sauce and sausage over pasta, but it works so well served over spaghetti squash..it’s an awesome combination! Heat oil and butter in a dutch oven or soup pot over medium high heat. Add onion and cook until softened, stirring often, about five minutes. Add garlic and cook for 30 seconds. Add red wine and cook until the wine is reduced by half. Stir in the tomato paste, salt, oregano, pepper, tomatoes and tomato sauce and bring to a boil, breaking up the tomatoes with the back of your spoon. Reduce heat to medium low and let the sauce simmer for at least 25 minutes. Stir in the cream, if using, and season with additional salt and pepper to taste. Preheat oven to 4oo. With a sharp knife, slice the stem off the squash and cut it in half lengthwise. Scrape out the seeds with a spoon and discard. Drizzle half the olive oil over the cut sides of the squash and sprinkle with salt and pepper. Place on a baking sheet, cut sides down. Place sausage in a baking dish and drizzle it with the remaining oil, tossing to coat. Poke a few holes in each link with a sharp knife. Place both the squash and sausage in the preheated oven and roast the sausage for 25 minutes or until cooked through and beginning to brown, turning occasionally. Roast the squash for 45 minutes or until very tender. Remove from oven and slice the sausage and add it to the sauce. 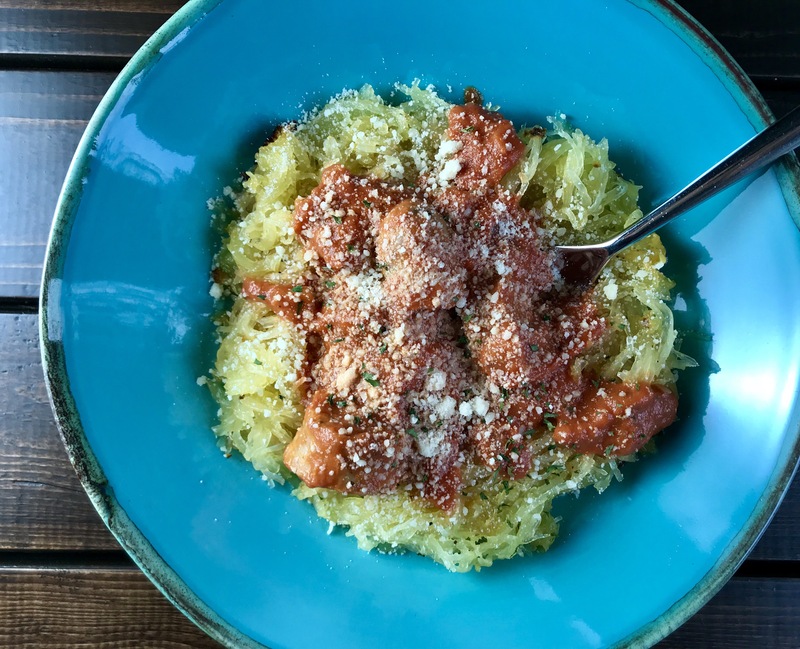 Scrape the flesh away from the skin of the squash with a fork to loosen the “noodles”. Like you, I had few technology skills but a friend who was a whiz and he helped me order exactly what I needed so I didn’t have to go into the store which I’d rather set my hair on fire than do anyway. Good luck with a replacement.